Thank You, Ma’am by Langston Hughes is a short story about the lessons learned in a chance encounter between a young man who wants a pair of blue suede shoes and the woman whose purse he plans to steal in order to buy them. What does the woman see in him that others might not? Show the video adaptation before reading the story to help students comprehend the text or after reading to discuss how they envisioned the story versus the decisions made by the director and actors. Play the audio while students follow along to help them comprehend the text. The texts below can be used to help students gain background information on the short story and to help them connect the story to their own interests and the world around them. 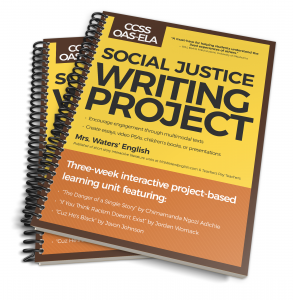 Looking for an interactive project that will foster student empathy, encourage activism, and build group collaboration skills as part of a writing project? Delve into highly-engaging spoken-word poetry, music videos, TED Talks, and an essay written by 17-year-old author Jordan Womack. This unit contains everything you need to guide students through reading and viewing modern literature covering social justice topics, responding to daily essential questions, planning and writing a culminating essay, video, presentation, or children’s book that encourages students to tell their stories and take a stand for others.